I guess the most surprising — and touching — review came from a friend who I consider one of the good guys. He’s polite, thoughtful and eager to help the needy. If he saw an old widow’s cat stuck high up in a tree, he’d commence to climbing. He said my book made him want to be a better person. It’s true. We can all be kind, stylish, bold, playful, work hard, be charitable and go for every par 5 in two. Arnold Palmer had a lot of money — some estimates say as much as $800 million — but none of those soulful behaviors requires even a cent. It’s why I tell people this isn’t a golf book. That’s the subtext of “Arnold Palmer: Homespun Stories of The King,” today enjoying its official nationwide release (thank you Triumph Books!). Surprising, isn’t it? It seems like to me the book’s been out and robustly selling for six months. In fact, I got my first copies March 31. What’s happened in those six weeks? Well, it seems like every single man, woman and child in Latrobe has bought three copies each. 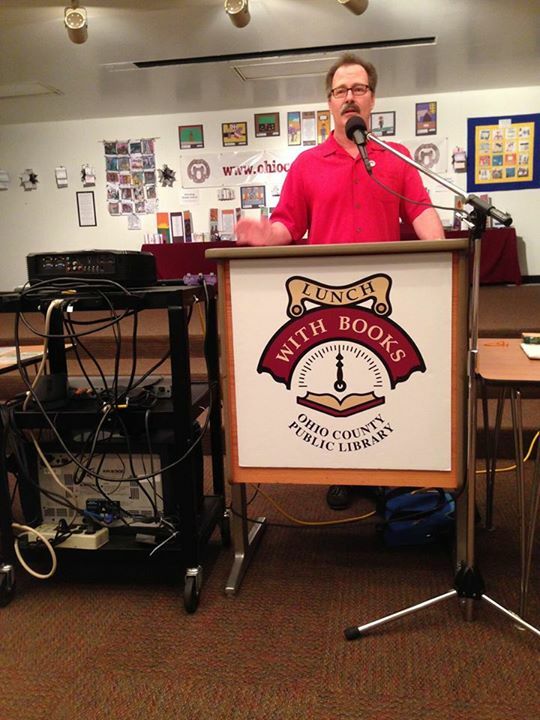 I’ll be speaking Thursday 6 p.m. at the Adams Memorial Library — registration required — right there near downtown Latrobe. I’m overjoyed by the local reaction. It feels like the book’s put a smile on the whole face of Latrobe. “If you're an Arnold Palmer fan (and who isn't? ), or a golf fan, or a fan of really, really great storytelling, I suggest you plunk down some of your hard-earned cash and buy my friend Chris Rodell’s new book, "Arnold Palmer: Homespun Stories of The King. I’m so flattered by this kind of praise. My publisher said they are thrilled with the pre-sales and all the interest the book’s already drawing. I asked what we could do next to ensure strong sales in places beyond Latrobe. Ten or more 4 stars? I hear more than that when I stroll from my Tin Lizzy bar stool to the men’s room. So if you did like the book and have the time, you’ll be helping me out if you can sign onto Amazon right here and say nice things about the book. I for years have dreamed of getting a 5-star review from some critic based solely on nasal reasons. If the book made you want to be a better person, I’ll be humbled if that’s what you say. As long as no one says the book is a real stinker. So will you do it? Can I count on you? Is it too much of an imposition? Sorry, that’s just me bein’ nosey. • To celebrate the official release day of "Arnold Palmer: Homespun Stories of The King," here's a 1:20 video of me discussing how Palmer's rivalry with Gary Player extended to even things like the consumption of bacon. The praise, the gushy radio interviews, the 5-star reviews, all the friendly strangers eager to hand me money for signed copies — it’s all going straight to my head. And I’m not even getting into me being the recipient of the prestigious TINARA award. It’s been a heady month. I for the first time in my life know what it feels like to be a celebrity. People who just six weeks ago would have ignored me want to have their pictures taken with me. I wonder how my life is going to change when they hear about TINARA. All this over a book that won’t be officially released until May 15. That’s the day the book will be fully stocked at most major book sellers in America. I received 50 copies in late March. Many of these were distributed to men and women who helped me get the book published and make it what it is. Then on April 4 I ordered 250 copies. These were gone in 15 days so I ordered another 250. Those, too, were gone in 15 days and yesterday I took receipt of another 250. It’s not uncommon for people to buy 12, 15 or 20 signed copies at a time. I had one casual friend order two — one for his grandson and one for his boss. Two days later, he said his boss said it “was effing great” and wanted to buy 10 copies. I mention this gent because we’ve never met and he is not quoted in the book as some enthusiasts are. He just loves the effing book. I’ve in the past week done radio interviews with hosts in Houston, Charlotte, Orlando, Jacksonville, Pittsburgh (John McIntire) and two right here in Latrobe (Hank Baughman and Mike Dudurich). The praise I get from these is startling. They tell all their listeners how much they love the book and how they have to buy it. They universally love Arnold Palmer, have their own stories and are thrilled to promote an author who has a different take. I think one of the reasons the book is being well-received is because of how little it has to do with golf. It’s a book about life. One radio host said it was the best book about any golfer he’s ever read then floored me by saying it’s better than any number of books by a Mount Rushmore of famous sports writers who’ve written about golfers. Could I soon be the recipient of my second TINARA? I spoke this week at luncheons for the Ligonier Rotary, the Latrobe Rotary and yesterday at the Westmoreland County Chamber of Commerce. I think I have my talk honed to a nice pacing — lots of laughs mixed with insider stories and insights about Palmer. And I sold a lot of books. 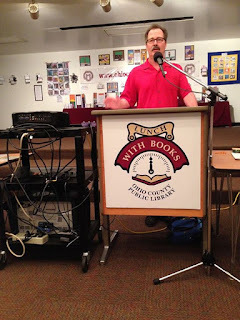 Tomorrow I’ll be a featured author selling books at the Altoona Book Festival. Feature writer Ken Love of the Altoona Mirror composed this flattering profile for today’s paper. And I’m starting to see the 5-star sales-boosting reviews on the internet. I’ve been Googling the hell out of myself lately. That’s how I first saw mention of my TINARA, the elusive snipe of publishing industry awards. See, I made it up. But I fooled the internet into thinking there is. I’m so proud of that book and optimistically remain convinced it will one day enjoy the reception the “Homespun” book is getting. Reader reaction convinces me it is great. People love it, say it’s better than Kurt Vonnegut. I wanted to bestow it with some distinguishing aplomb, something that would help it stand out. Thus, The TINARA satire award was born. I had my web wizard add that spiffy sticker to the web page then I forgot all about it. Some one or something charged with compiling a profile of me fell for my fraud. I can only hope now that there’s an independent mention, my TINARA award notice will proliferate and flourish as part of my enduring profile. And, really, it should. Because in our era of hokum and humbug the TINARA is the perfect award for times when all the news feels like satire. One of these days I’m going to have to have a trophy made for some phony-baloney TINARA awards show. It was in 2008 when I was interviewing Arnold Palmer coincidentally the day before I was to play Oakmont Country Club, regarded by experts as one of the toughest golf courses on the planet. I told Palmer I’d be playing there and asked if he had any suggestions for how I could get a good score the next day. That’s just one of the stories I’ll be telling this evening at The Oakmont Library from 6 to 8 p.m. Stop by if you’re near. These talks get happy reactions from the audiences and I wind up selling lots and lots of books, which leads to happy reactions from me. Here’s a partial list of what I have going on through Father’s Day. • Thursday, 10 p.m., KDKA-AM 1020, The John McIntire Show — I’ve been doing John’s show for 15 years now and it’s always a treat. So you Penguin fans will have a choice: Me and John or Sid and Geno. • May 8, noon, Ligonier Rotary, Dave & Carol’s Roadhouse — I was given the option to talk about the new Palmer book or “Use All The Crayons!” I chose … “Crayons!” It’s still such a fun talk to give and as of now I have more copies of “Crayons!” to sell so there are logistical considerations. • May 9, noon, Latrobe Rotary, DeNunzio’s Restaurant — This will be the first serious run-through of the Palmer talk, and it’ll be in front of a roomful of supporters so it should be a real confidence boost. One problem: Most of these friends have already purchased multiple copies of “Palmer: Homespun.” Will the talk be a success if it gets great reaction but few sales? I think so. • May 10, noon, Westmoreland County Chamber of Commerce, Fred Rogers Center, St. Vincent College — I’m so confident this one will go well and am so pleased with the audience and the venue, I’ve hired a friend to film it. My hope is to get a bunch of YouTube videos like this one. • May 12, 10 a.m. to 4 p.m., Altoona Book Festival, Altoona Library — A reporter from the Altoona Mirror is doing a story on me that will run the day before this event. I’m excited. Could be very good. • May 17, noon, Good Guys Social Club, TGIFridays, Bethel Park — This is Pittsburgh Pride author Jim O’Brien’s social club. There will be about 50 men there and if my ’16 appearance is any indicator, I’ll sell a lot of books. Audience will include former Pirate manager Jim Leyland and announcer Lanny Frattare. • May 17, 6 p.m., Adams Memorial Library, Latrobe — Yes, it’s doubleheader day! Very eager for this home game. Again, lots of friends. • May 19, 2 p.m. Barnes & Noble, Greensburg — These always feel like a big deal to me. Some go well, some don’t. The store manager says she’s ordering 25 copies of “Palmer: Homespun.” Sounds about right but, just in case, I’m bringing along another 25 in my trunk. • May 29, noon, Ohio County Public Library, Wheeling, WV — This will be my third time with them at their “Lunch With Authors” event. It’s always a big deal. I really enjoy it and have both times left feeling like I’d robbed a bank. I’ll sell lots of books here. • May 31, 7 p.m., Mt. Lebanon Public Library — With old school friends, neighbors and all Mom’s chums from church I’m expecting a riot. A very polite riot, but a riot nonetheless. • June 7, 6 p.m., Carnegie Library, West End — I have no idea what to expect here. It could be 30 or it could be 3. Either way, I’ll walk out the door with at least one new friend. • June 8, 6 to 9 p.m., Cooperstown Social Club, Latrobe — Kevin Smetak runs this historic club. He is a big and enthusiastic supporter of me and my books. I’m proud to have him as my friend. He’s cajoled Yuengling Beer to sponsor my book signing! I have a lot of friends at The Coop and am optimistic we’ll have a good time this night. • June 14, 6 to 9 p.m., Flappers at The Tin Lizzy, Youngstown — Ever dreamed of drinking an Arnold Palmer while you’re buying a book about Arnold Palmer in a building Arnold Palmer spent time in his whole life? Well, your dreams are a lot different than mine. But I spend a lot of time in Flappers (one floor below my office) and bartender Zach Starrett suggested the dual promotion might be a winner. I think he’s correct. Hope to see you at one of the public events. If that’s not possible and you’re eager to buy a book, please stop in at The Tin Lizzy and bang on the ceiling. I’ll be happy to come down and visit.